In my childhood, it was a common sight to see kids playing with marbles or boys running with the tyres and wheels. The slightly elder ones graduated to games like gulli danda and later on to kabaddi and other desi sports. It's rainy season. Two decades back it was usual to see kids playing in the sand and making mud houses. Also, kids would play with a rod. The boys would throw the iron rod and the depth to which it went into the ground, determined a boy's success. After India's world cup win in 1983, the advent of television and the steady rise of prosperity, all these 'unsmart' things faded away from urban India. Even in villages you no longer see the games which kids played in the past. On a recent visit to a 'lost town'* in Central India, I felt as if I was again back to my childhood. In the first photo, you can see kids sitting on a platform, around a mazaar, and immersed in their games--two kids are counting their glass marbles (kanche), two others are comparing their collection of cards with movie titles and stars printed on them. Others are playing one of the desi version of ludo-type games in which kids use chalk to make a pattern and then play with pieces of stones or the gotis (gotiyan). In every street or corner, I found the kids loitering, collecting matchboxes or playing games. The two kids with innocent and earthy looks one of whom aimed at me with the ghulail (slingshot or catapult) were sitting in the morning when I passed the area and again when I walked back in the evening, they were sitting there. 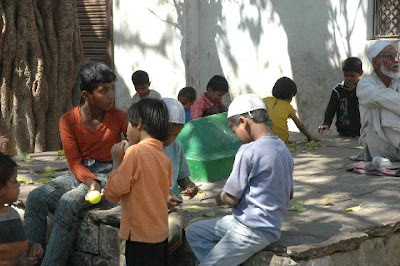 The Indian Muslim street (or for that matter any ghetto) is quite similar in most cities of North India, and the unemployed youths and kids are still seen simply sitting and whiling away time or playing such games. As I was busy in my job, I couldn't roam around and get many pictures, but the town had a strange effect on me. I will write about it more in coming days. Though the trip brought back nostalgia, it made me sad to see the lack of schools and dispensaries. Goernments won't open schools (long back it seems state governments have stopped opening schools and left the field open for private schools). The parents have no option but to let kids roam and play. 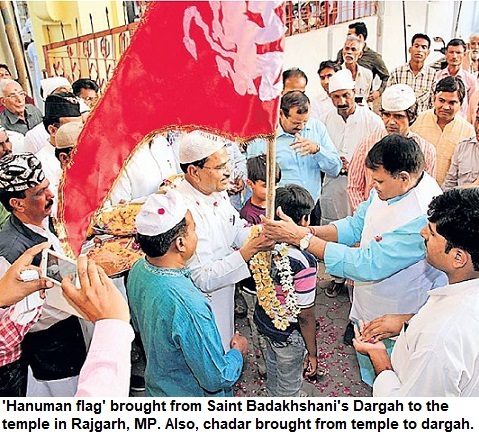 A few years from now they will also help their parents in weaving, carpet making and bidi industry.